Los Angeles’ The Far West came together in 2010, thanks in part to a Craigslist ad featuring nothing but a link to a live clip of Waylon Jennings on YouTube. Each of the five members left other bands for a common goal: to make music inspired by artists such as Gram Parsons, Uncle Tupelo, Son Volt, and The Band. They released their self-titled debut album in 2010. Before long the band partnered with respected booking agent Mongrel Music, and have been consistently growing and selling out shows in the West ever since.Their second album, Any Day Now, is out February 25, 2014 on Medina River Records and is steeped in alt-country with a few flourishes. But not everything has a roadhouse sound. “Leonard,” about the folk-artist who built the famed Salvation Mountain in the California desert, includes horns. "You can definitely hear the influence of songs like 'Minnie the Moocher' here," says Briante, "but this arrangement is also influenced by Springsteen’s Seegar Sessions, and some of Levon Helm’s horn treatments.” The band called on Nic Chaffee, who added the warm and vibrant brass. Black backed many a band in his home state of Texas as well as groups from the across the country. Briante, from New York state, has played in dozens of bands since he was a teen, and found Black in LA via the sparse Waylon Jennings Craigslist ad. James Williams has lent his keys to several acts over the years and has performed live on KCRW's Morning Becomes Eclectic with Nic Harcourt. Chicago native Aaron Bakker (guitars, vocals) found his true passion for music when he picked up his first guitar at fourteen. He was an integral part the Chicago outfit Dorian Taj, and dozens of others.Travis Popichak has been a hotly sought-after drummer in Los Angeles for years. 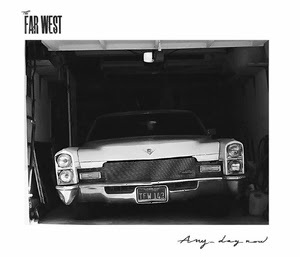 This is producer Colin McLean's second album with The Far West. He recorded their first album at an American Legion Post while the bar was open for business – and, in keeping with his interest in using unusual spaces, recorded Any Day Now in a vintage hot rod repair shop. “The room you use to record really makes an imprint on the overall sound of a record, so using places that have lives of their own adds something special I think,” says McLean. The album’s title, Any Day Now, was borrowed from an article on the band that asserted expectantly, "A follow up album is due any day now." That was over a year ago, and any day now has finally come.